This week Pope Francis, the recognized leader of the Catholic church made his first visit to the U.S. Pope Francis is extremely popular, not only among the Catholic church but with many non-Catholics as well. His outward demeanor, his refusal to hide behind the peaceful sanitary confines of the Vatican in favor of mingling with his flock and dirtying his hand in service have not gone unnoticed. He is truly a peoples’ Pope. The overwhelming crowds and cheers along his parade route and the pomp of his arrival yesterday is not too surprising. What is surprising, however are those who not only oppose his visit and his views, but who do so with disdain and a classless disrespect for the position. Just today on popular social media sites he has been called a moron, a dope, a tree-hugger and other unmentionable labels by those who have no fear or reverence for the Church or its leaders. The protestors and hate mongers have already made their presence known and this is only the first full day of the Pope’s visit. I am not a Catholic but I attended a Catholic High School and I appreciate the history of the Catholic Church and understand somewhat its long held Christian views on many of the social issues that have polarized the Church. I don’t have to be in agreement with every stance held by the Catholic Church any more than I agree with all the various Protestant beliefs of my current practice. That said, the Catholic church, perhaps more so than the Protestant counterpart, has held firm and in line with the Biblical views on the sanctity of marriage, the protection of the unborn and the benevolence of the under privileged that society chooses to overlook. 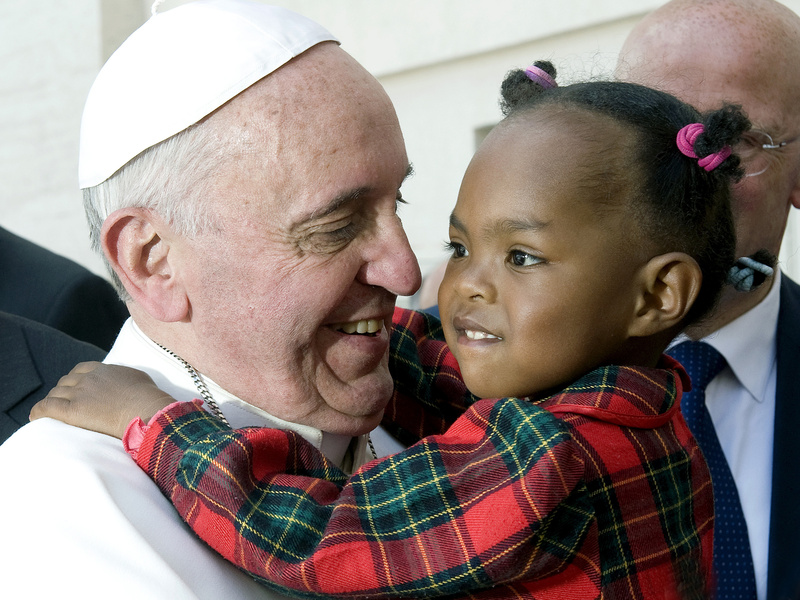 Pope Francis favors responsible and reasonable capitalism as a means to further provide for the “least of these”. To many he seems to be saying and doing all the right things. This fact alone has brought out the end-timers in great numbers. Throughout modern history there have been those who are sure who the anti-Christ will be, where he will come from and how we will recognize him. Various apocalyptic movies have portrayed the anti-Christ coming from the Vatican. You don’t have to search past the first google page to find articles claiming the possibility of this Pope being the anti-Christ. While I am not ashamed to admit I don’t know everything, I find it both laughable and sad that a man who is doing everything according to scripture, both Catholic and Protestant scripture, and consequently being hailed by the hundreds of millions he represents as the genuine article, is being labeled an anti-Christ because of his resulting popularity. Katy Perry, Justin Bieber, Barack Obama and Taylor Swift EACH have over 60 MILLION followers on Twitter. Should we be looking at them as possible anti-Christs because of their popularity? Is there any credibility in the criteria being used to prop up the Pope as being Anti-Christian? I would argue that not only is that answer a resounding No but Pope Francis seems to be the embodiment of what a Christ follower should look like. If you read scripture closely, you will see that everywhere Jesus went crowds followed. Another argument touted by many non-Catholics is that no one man should be given so much attention or held in such a high esteem. This would be true if one were propping himself up as a god to be worshipped and followed. We are to have no gods but God. However, there is a story in the book of Acts that gets little attention. It involves the Apostle Peter, viewed by most as the first head of the Church. There is a lot of misunderstanding between the Catholic, the Orthodox and the Protestant churches, and sadly a lot of exclusivity. We don’t accept iconology so it must be wrong. We don’t get incense or confession so it must be inaccurate. We don’t accept free worship and non-liturgical approaches so they too must not be correct. I wish it weren’t so. I’ve looked and looked for geographical, denominational and liturgical parameters in scripture but to date, I have found none. What I have found is that God so loved all the world, He gave up His Son. All who accept, believe, emulate and worship Him are called children of God. I find that true religion consists of taking care of orphans, widows, homeless and the less fortunate without boundaries or qualifications. Any man that shows me how to do this has my respect as a religious leader, be they a Pope, an Orthodox priest, a monk, a nameless face working skid row, a missionary to a third world country or even (choke) a political leader. When we stand before the throne of Christ there will be no titles, no rankings, no vestments and no exclusive recognition. We will be on our faces before the one true and forever leader of the Church. Until that day comes we have been given the Pope Francis’s and the Billy Grahams to emulate as leaders. If we are called through Holy Scripture to uphold, pray for and respect those in public office, how much more should we show the same respect for our religious and spiritual leaders, even if outside of our faith approach or practice. God bless Pope Francis and all like him who carry the banner of Christ.